I really like the hoplite shields and the conversions. Now that I can actually post on here it's nice to be able to see that. Congrats on all the real life achievements too! Seem to be suffering from a giant image problem. It's blurry, and I'm guessing you intended it to be more of a unit picture (I could be wrong there). But it looks like you got some lion cav painted. If that's the case I'm looking forward to a nice picture. Maybe these will work out better? 10 of them, that is impressive. Those tails much make the 2nd rank pretty much impossible rank up perfectly. What did you do to the champions lion? It's got a nice pose. EDIT: The tails are the biggest hurdle, but since the lions are really not meant to rank up, some of the ones that DO rank up look like they're biting the rear ends of the ones in the front rank. I swear, it's like herding cats! Really nice Luna, great definition on the riders. nice conversions with the griffons and the lion guard. That is a stunning unit. 10 lions is impressive indeed. I can imagine the ranking issues they bring. Still, it's worth it for the look I think. As someone who had several regiments of the old skaven clan rats, I very much understand the horrors of ranking up units with tails. 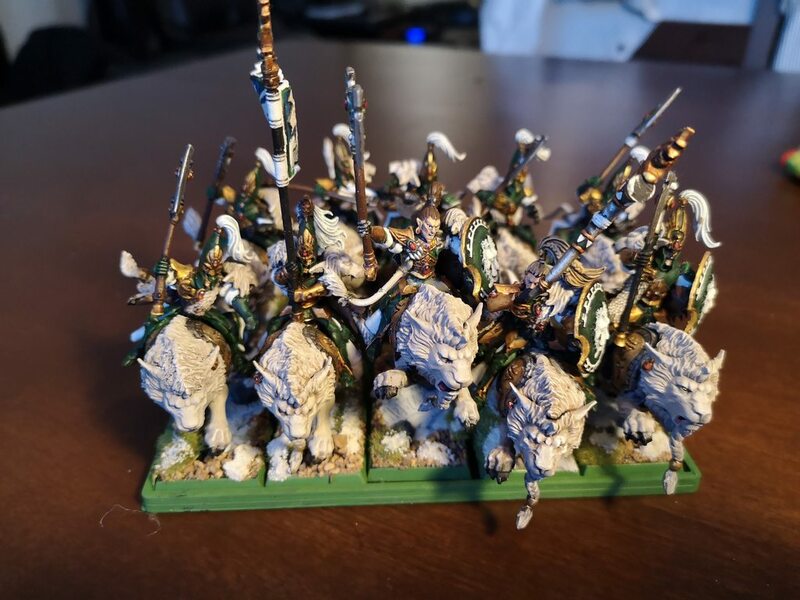 I have a lion chariot to paint up soon, what colours did you use for yours? Thanks for all your kind and supporting words everyone! Thank you! I always found it a bit odd that there was no clear regional feel to any of the units, no customization options in the kits to even hint at where the army comes from. 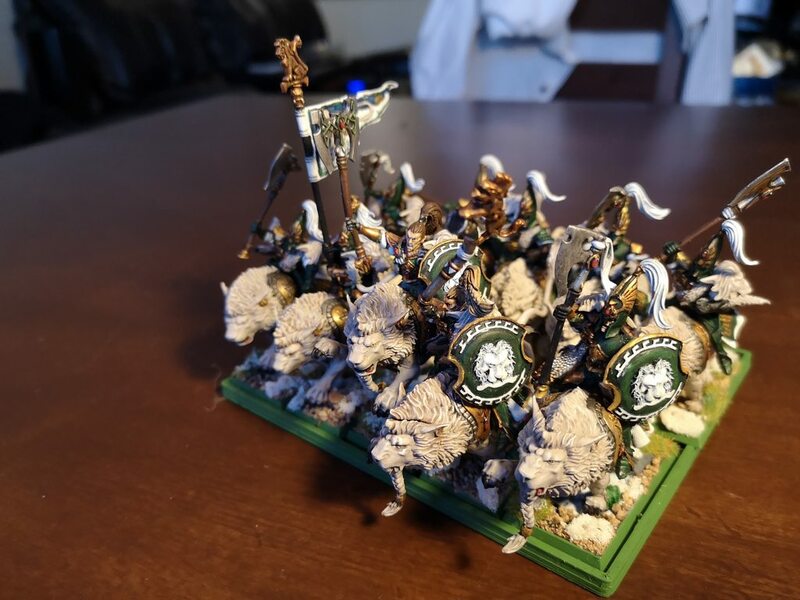 I also needed to have something that would work as Drakon Riders (small, non-fire breathing drakes) in Kings of War, and as I don't like dragons or their pompous riders, I felt that griffons would work far better. I thought so as well, the visuals were always my favorite part of Skyrim. Snow also fits Chrace very well, but fighting in full-on winter is unlikely, and Ulthuan being as close to a paradise as possible, I didn't think it'd look right to have full snow bases. I'm thinking of cutting the tails just right off from the front rank, just to get them to rank up. The tails don't show up on them as much anyways, whereas the horrible ranking is painfully clear. As for the lion's colors, I went pretty basic. Black undercoat, Rakarth Flesh base and then mixing in increasing amounts of white. I think that I might add a few more layers at some point, but with everything that's going on right now I think that'll be a good year or more . For the chariot itself, the green parts are the same as the armor: Black undercoat, Caliban green, Warpstone Glow highlights, Waywatcher green glaze. All my golds are chocolate brown (can't remember the maker, not GW though), Auric Armor Gold, Agrax Earthshade, possibly Auric Armor highlights and Runefang Steel highlights. Metal is just black undercoat, Runefang Steel, Nuln Oil, Runefang Steel. Gems are black undercoat, 2/3 Khorne Red to leave 1/3 black in the "top" corner", 1/2 either Evil Sunz Scarlet or Wild Rider Red to leave a bit of the Khorne Red showing between the black and the lighter red, and a small Troll Slayer Orange at the "bottom" corner. Finally, a small white dot in the black area and a layer of gloss varnish. Flesh is simple Kislev Flesh, Agrax Earthshade (which is too dark, going to change to a lighter shade), Kislev Flesh highlights, and MAYBE a mix of Kislev Flesh/Ushabti Bone highlight. Actually is a better idea to use griffons than newly invented small dragons, as these are smaller and should be much more common in the vast and numerous mountain ranges of Ulthuan. And definitely feels better when you are not using a Caledorian army. What green are you using for your armor? Black undercoat, Caliban green, Warpstone Glow highlights, Waywatcher green glaze. Is Rakarth flesh like a bleached bone or a more earthen tone? Of course, some of it is an approximation. But it helps in discussions and when buying paint. 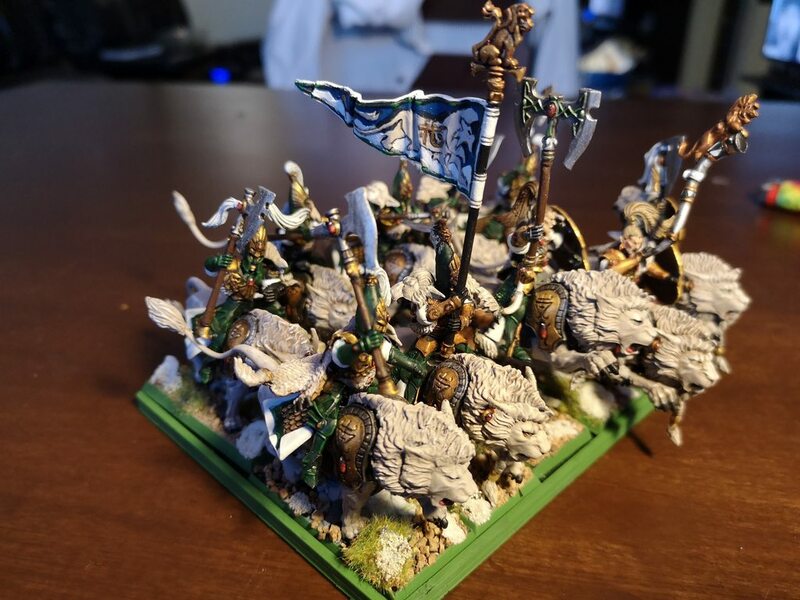 It actually made me register to the forum as it inspired me to build a Chrace themed army. I'll be looking forward to read more about it! Dude, that's sick, didn't I send you some Lions for something like this?